We hope everyone had a happy holiday season. Our Christmas holidays were spent at the City Marina in St. Augustine while visiting with family and friends. We have stayed on the mooring balls here before but this was our first time at the city docks. We enjoyed the proximity to town and kept busy each morning with a 4-5 mile walk through the historic neighborhoods. We were constantly entertained as boats came and went like clockwork as the Bridge of Lions opened each half hour to allow passage. 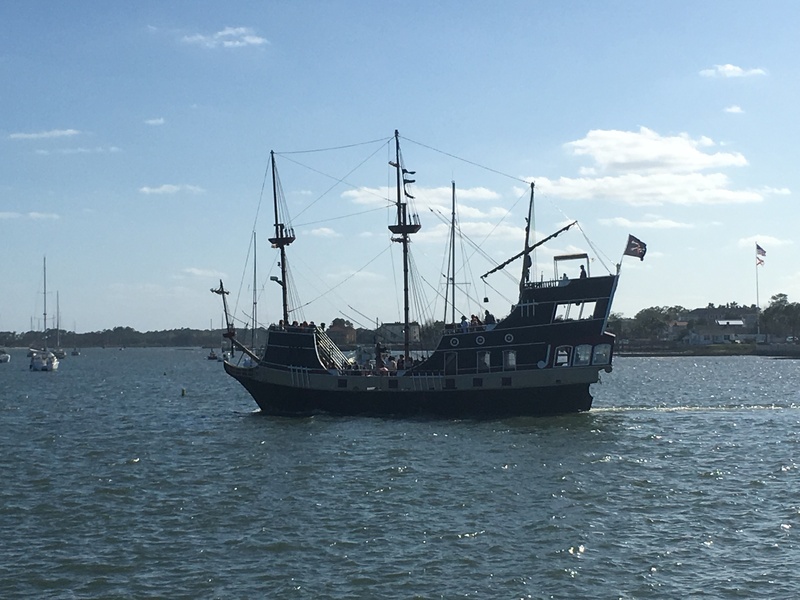 Several times a day we would see the pirate ship “Black Raven” and the sailing schooner “Freedom” join the parade of boats as they took paying guest out for a sail. We held our breath each time another boater was assigned a slip next to us. The current here is a fierce 4-5 knots at it’s max and we saw several boats crash into the docks and other boats while docking. Luckily, Idyll Time was spared this injury. 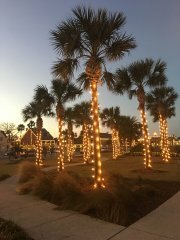 St. Augustine goes all out each year for their holiday light celebration. 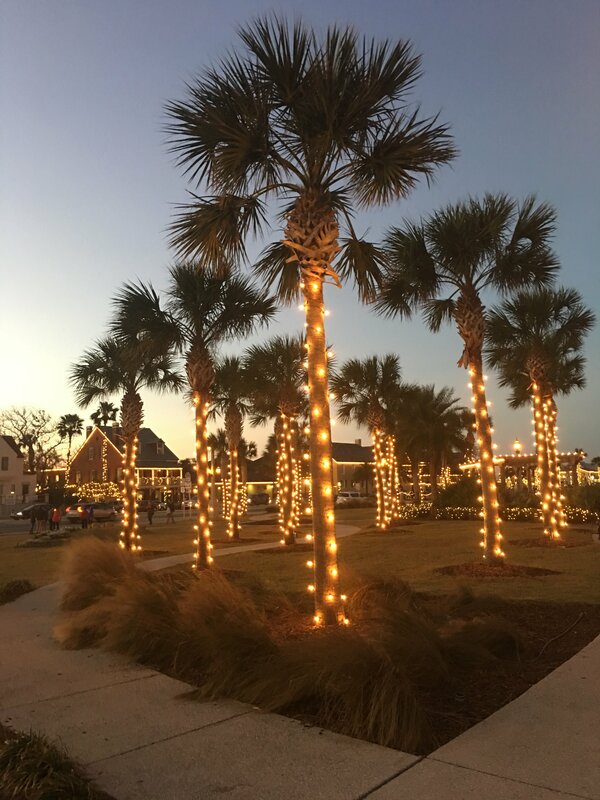 Over a million lights are festooned throughout the downtown area. The city is lovely during this time of year. This does however bring hordes of tourists to the town each day. We learned rather quickly to stay away from this area on the busy weekends. As our departure date approached, the weather reports looked very favorable for an offshore run to Ft. Pierce. 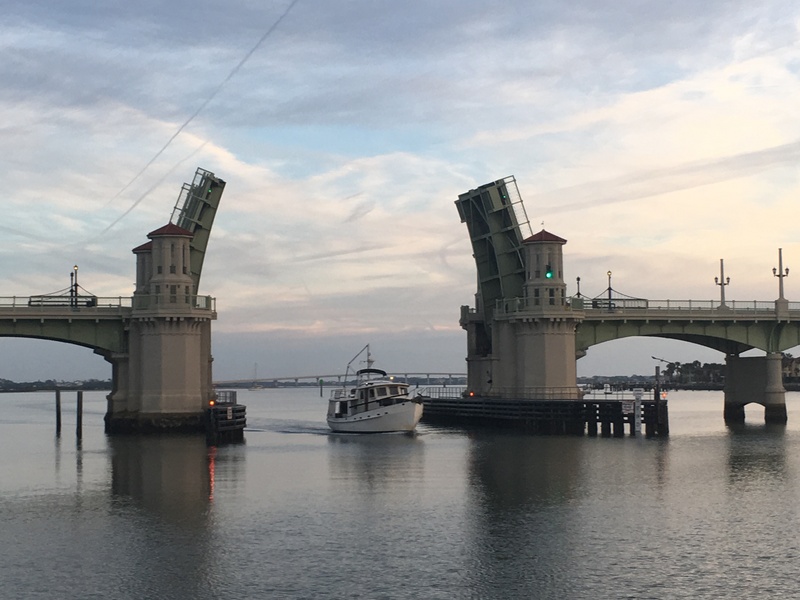 By running the 220 miles offshore, we can make it to Ft. Pierce in one overnight run vs. four days on the ICW. 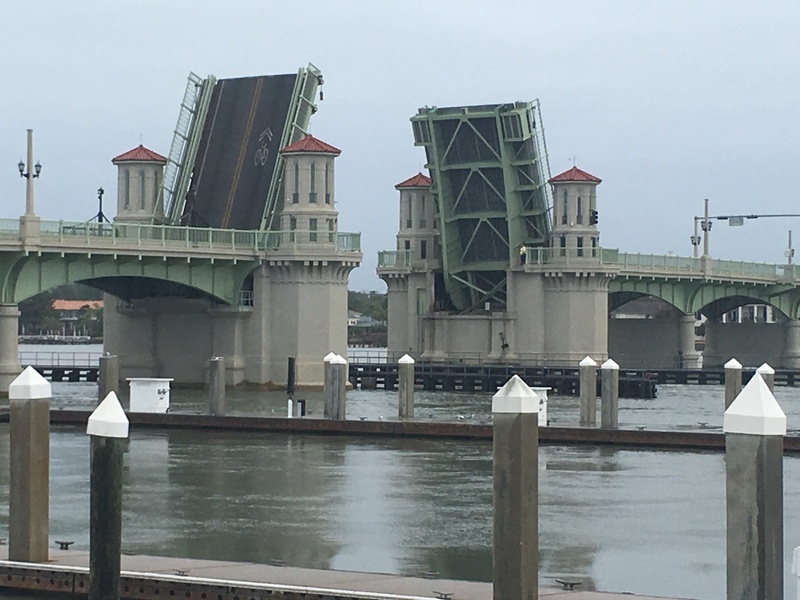 The St. Augustine Inlet is notorious for shoaling and with the recent hurricane Mathew hitting this area, reports from other cruisers had said to avoid this Inlet. A call was made to Sea Tow and they assured us that all buoys were back on station and we should have plenty of depth as long as we stay close to the red buoys. With this news we eagerly prepared for our overnight run. 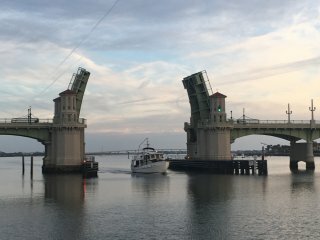 We time our departure from the marina to catch the 7:30 AM Bridge opening. As the bridge opens, we see who else but another Krogen 48 heading the other way. We have never seen this Krogen before but it appears to be an older boat. They are heading south on the ICW so maybe we will see them down the line. Although there is always a little tension in the air as we exit the inlets for our overnight runs, we very much look forward to these opportunities. Traveling overnight is always very enjoyable and this trip even more so as we have a special passenger with us. Sadly, Jeff’s Dad passed away in October. With us are some of his ashes which we will place in the Gulf Stream. 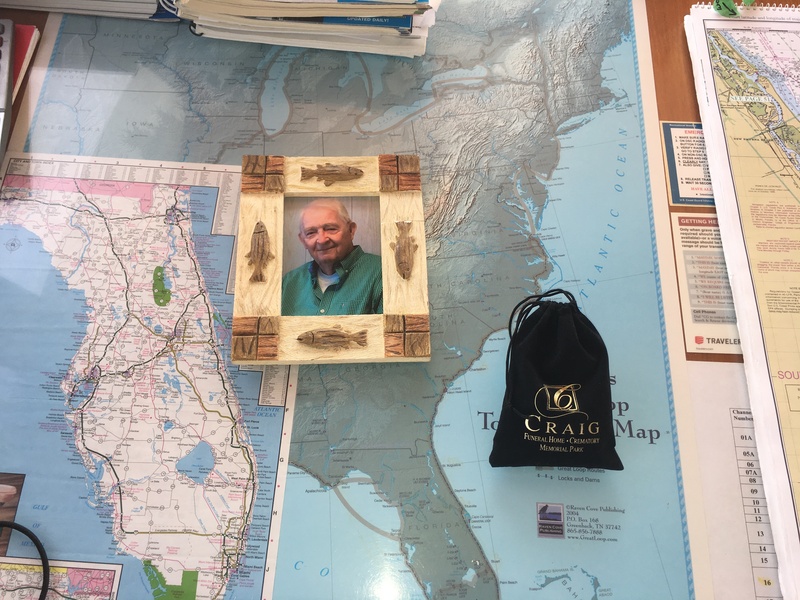 Being an oceanographer and studying the Gulf Stream, it seemed fitting that this is where some of his ashes should reside. 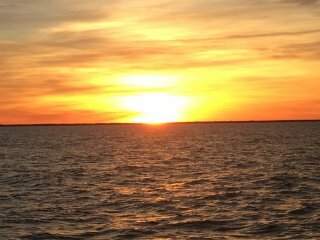 The seas are calm and we have a peaceful day on the water. Other than quite a few shrimp boats, we are alone on the North Atlantic. 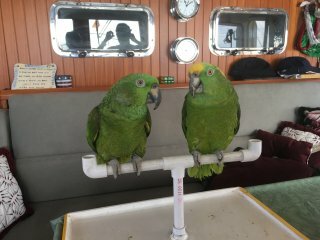 Nate and Primo spend the day in the pilot house with us as we work our way south. During the day we stay only several miles off shore as we pass Daytona with high rise condos one after the other lining the shoreline. 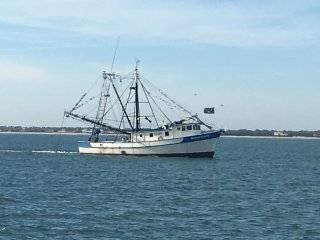 We enjoy the nice day on the ocean with only two ft. Seas. As darkness approaches, we ease farther offshore. We see little to no boat traffic. Nearing Cape Canaveral, we make a 90 degree turn and work our way out to the Gulf Stream. Ten miles off shore as we near the Gulf Stream, the seas pick up and the ride becomes quite lumpy. Idyll Time with her stabilizers working overtime, handles the 3-4 ft seas with ease. 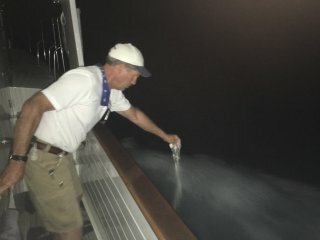 At 1 AM as the GPS shows us firmly in the Gulf Stream, Jeff ceremoniously deposits his Dad’s ashes into the warm Gulf Stream water. 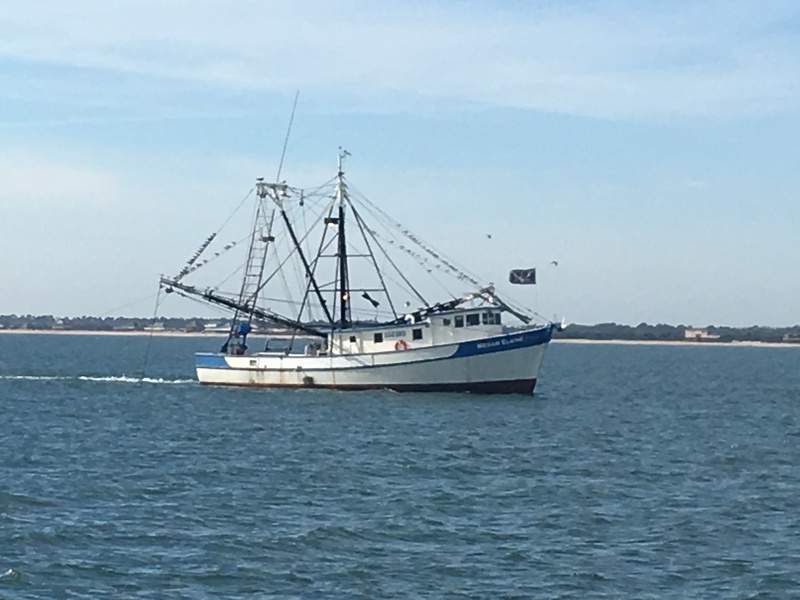 With our mission accomplished, , we make a bee line for the Cape Canaveral Coast as conditions are rapidly deteriorating in the Gulf Stream. We now have 4-5 footers on a five second period, not a very enjoyable ride especially at 1 AM in the morning. 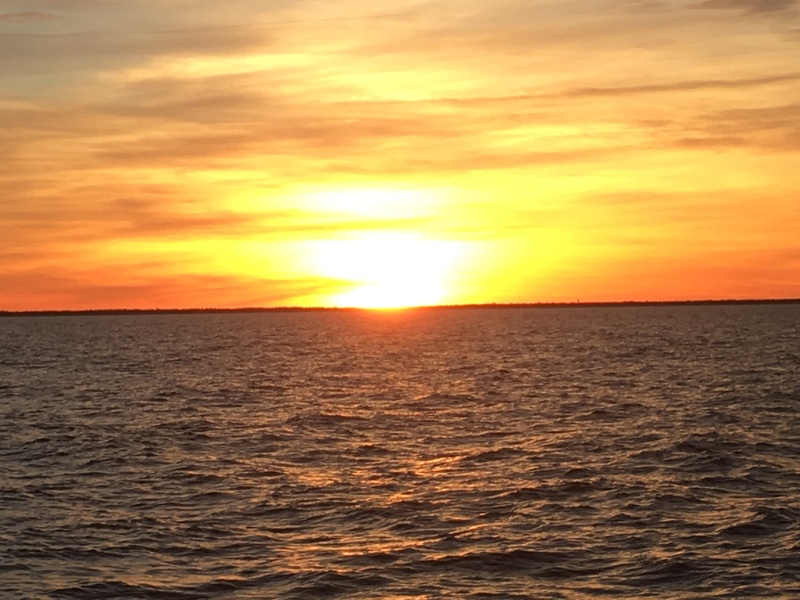 As we work our way closer to shore, the seas gradually improve and we resume our night watch rotation. We are both up in the pilot house as the sun peeks it’s head above the horizon, always a welcome sight on these overnight runs. An hour later, we reach the outer sea buoy for the Ft. Pierce Inlet. Once through the Inlet, we pull off the ICW for our anchorage and soon have the anchor deployed and engines shut down. Idyll Time has once again provided us a safe passage on the water. She always takes good care of us. Now it is time to give her some attention. We will stay here until being hauled out in a few days at Cracker Boy boatyard here in Ft. Pierce for bottom paint and other maintenance work. Now it is time for some sleep. Thanks for following along. This entry was posted on January 15, 2017 at 7:19 pm. You can follow any responses to this entry through the RSS 2.0 feed. You can leave a response, or trackback from your own site. 1 Response to "St. Augustine to Ft. Pierce"